All objects emit infrared energy (heat) as a function of their temperature. The infrared energy emitted by an object is known as its heat signature. In general, the hotter an object is, the more radiation it emits. A thermal imager (also known as a thermal imaging camera) is essentially a heat sensor that can detect tiny differences in temperature. Thermal imaging cameras effectively translate heat - that is, thermal energy - into visible light to analyse surroundings. These cameras can be very precise, requiring only a small amount of heat to work effectively. Visible light is extremely useful, but it’s only a small part of the electromagnetic spectrum. Infrared radiation, the kind produced by heat, takes up more “space” in the spectrum. The interplay of heat being absorbed, reflected and transmitted is what thermal imaging cameras capture and evaluate. The level of thermal radiation emitted by an object is called its heat signature. The hotter a given object is, the more radiation it will emit. The thermal imaging camera is capable of distinguishing heat sources and very small differences in thermal radiation. It compiles this data into a complete “heat map” distinguished by heat levels. The most common problem – and the one easiest to detect – is heat loss from walls, piping, HVAC components, doors, and windows. Because infra-red thermal imaging cameras can cover such a wide area, it is not uncommon to spot problems that you weren’t expecting to find. You may be looking for one issue, but the thermal reading will bring another trouble spot to your attention. A commercial buildings roof is one of its most valuable assets. You can use thermal imaging to track roof conditions and spot problems before a potential major leak occurs. In the vast majority, roof problems are punctures, compromised membrane around HVAC units or gaps in a seam. Water will saturate the insulation above the roof and take longer to radiate than the rest of the roof because of a higher thermal mass. Using thermal imaging may remove the need to replace whole roofs as you can now isolate the damaged area for repair. As thermal imaging cameras allow you to take measurements from a distance, they’re ideal for finding issues in equipment that could pose a safety issue to workers or are hard to reach. Using thermal imaging cameras, Facility Managers will often find circuits that are overheating or motor bearings that are about to fail. When a motor isn’t functioning properly the outside of the housing will be noticeably warmer. At Glas Éireann Solutions, we are committed to reducing commercial, agricultural and industrial energy usage, energy overheads, carbon footprint as well as exposure to future energy price increase risk. 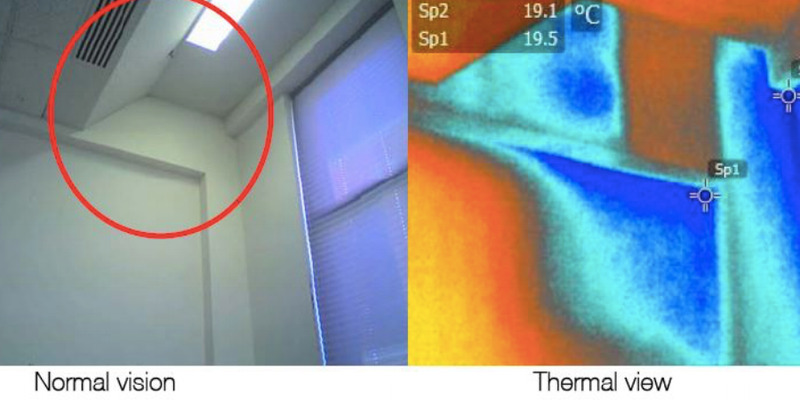 One of the methods we use during the commercial energy audit phase is thermal imaging. To find out more on how we can help your business, why not contact us here, or phone on 061 - 633 298. Alternatively, sign up for our regular newsletter, right here. Older PostDitch The Disposables, We Have!